Suzanne Aubert by Kapiti-based artist, Elspeth Shannon. The painting was commissioned and gifted to the Home of Compassion Island Bay in 2015. 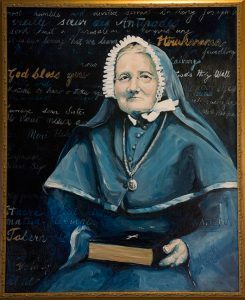 This story was related on a retreat – and quoted from Suzanne’s Directory – based around the spirituality of Suzanne Aubert. There is much in it that reveals something of Suzanne. St John Vianney had gifted her, she put much effort into meeting the needs of people from ‘all creeds or none’. She struggled with the Church hierarchy. She travelled great distances within Aotearoa New Zealand, always on the ‘main-trunk line’ and to Rome – at all times practising ‘contemplation on the hop’. Suzanne shared her vision and commitment – she built a faith and belief that gathered people around her – formed relationships, networks and friendships. 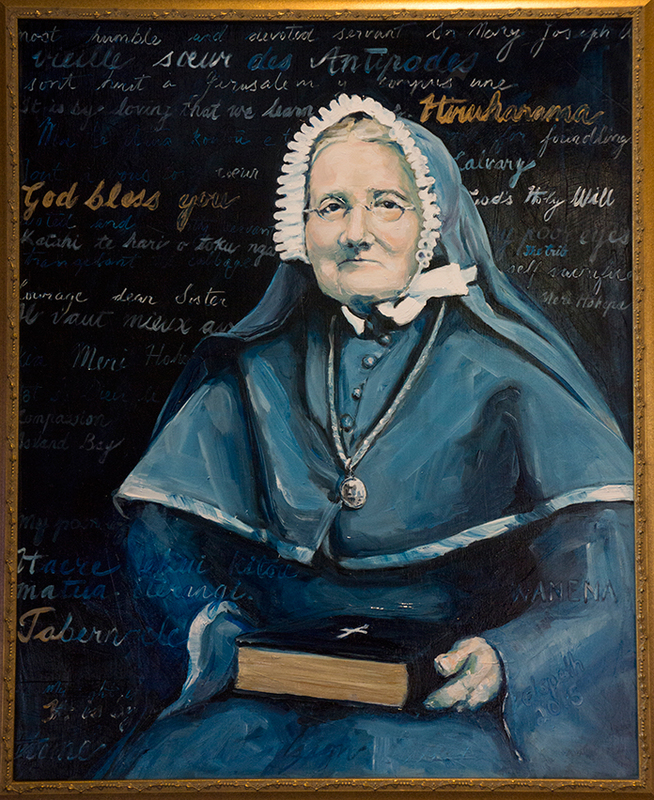 She established the Daughters of Our Lady of Compassion, Aotearoa New Zealand’s own religious order. She picked up the cross Christ had given her, every day, and followed Him. As Catholics we are familiar with imagery of the cup. At Gethsemane, just before his arrest, Jesus prayed: ‘My Father, if it is possible, let this cup pass from me, yet not what I want but what you want’. At the Last Supper Jesus ‘took a cup, and after giving thanks, he gave it to them, saying, drink from it, all of you’. When life gets tough. When things don’t go quite the way I thought they might. When I am hit with anger, frustration, weakness and failure, what is there to do but – ‘Catch the cup’. Joe Green is Lay Pastoral Leader, Catholic Parish of Wellington South.